The past few years have seen Mercedes-Benz product planners systematically make their way through the lineup, increasing AMG’s role, revamping the top-shelf S-class, and adding entry-level bait in the form of the CLA-class sedan and GLA-class SUV. Until now, they have essentially left the C-class (W204 in Benz-speak) to its own devices. A mild makeover a couple of years back improved its looks but failed to address its primary shortcoming: The BMW 3-series was a better car to drive. The 2015 C-class represents the maker at its Teutonic best, tenaciously addressing previous deficiencies with measured doses of technology and style. One look and it’s clear that the seed that flowered into the C-class was collected from the same stock as that of the S-class. The long, sculpted hood, the trademark fascia, and the posterior design have strong S-class cues, although the C-class loses some of the big car’s grace from the C-pillar back. Chalk it up to scale. The smaller, tighter body of the C-class means its highly stylized rump appears a bit less natural than it does on the more generous proportions of the zaftig S-class. Our drive was in C250 and C400 models—U.S. buyers will see the more powerful C300 in place of the C250. Both cars get a longitudinally mounted 2.0-liter turbocharged four-cylinder that’s a near clone of the sidewinder unit found in the CLA-class. When the C300 hits the States, it’ll arrive packing an estimated 241 horsepower and 272 lb-ft of torque, as well as all-wheel drive; the rear-wheel-drive C250 we drove overseas had its output suppressed to 208 horses and 258 lb-ft of twist. The C400 will arrive in the U.S. as sampled, its 3.0-liter turbo V-6 churning out 329 horsepower and 354 lb-ft of torque, all funneled through M-B’s 4MATIC all-wheel-drive system. A rear-wheel-drive C300 will follow the 4MATIC, and the recently confirmed C350 plug-in hybrid is expected to arrive in the fall of 2015. A diesel is likely on the horizon as well, but it’s our feeling that those committed to the oil-burning lifestyle will have a couple of years to scrounge up the down payment. All U.S.-bound C-class models get a seven-speed automatic transmission. We took our first turn at the wheel in a C250, and it was immediately apparent that the S-class vibe continues to the interior. Five round vents dot the dash, the middle three resting atop a one-piece center console that terminates just below the 8.4-inch (seven-inch without the Multimedia package) infotainment screen. The look—even in basic black soft plastic—is cohesive and light-years more refined and harmonized than that of the CLA. When accented by the available wood or aluminum trim and teamed with leather, the atmosphere goes pleasantly, tastefully upscale. We found the switchgear to have the substantial feel typical of premium hi-fi equipment. Those familiar with the Benz’s COMAND infotainment system, however, will be surprised to find a small, ergonomically shaped guard positioned over the COMAND control wheel. Far from a decorative fixture, it houses a touch pad with haptic feedback that permits the operation of all infotainment functions using finger gestures. The C-class grew a bit in the 2015 makeover, with length stretching another 3.7 inches, the wheelbase adding 3.0 inches, and width spreading by 1.6. We can’t say categorically how this affects front-seat comfort compared with that of the previous C-class, but drivers ranging in size from a Lilliputian five-foot jockey to a sasquatchlike six-plus-footer managed to find comfortable driving positions in the 2015 model. (The rear seats are definitely roomier, though.) A multiadjustable seat and power-adjustable tilting-and-telescoping steering wheel are pretty standard these days, but the way they intersect in the C-class provides for extraordinary seating versatility. Hustling the C250 over the smooth roads winding in and around Marseille, France, we experienced a comfort-tuned air suspension (a standard suspension with steel springs will be available) teamed with Mercedes’ new Agility Select system. Making its debut in the C-class, Agility Select is capable of adjusting throttle response, steering-assist levels, damper firmness, and transmission shift points. Parameters are determined by selecting Eco, Comfort, Sport, Sport Plus, and individual settings, the latter of which let you customize the various systems to personal taste. Driving enthusiasts that we are, we ran through the menu a few times before settling on Sport Plus, which revealed linear steering that weighted up nicely under aggressive cornering. Mercedes gives a lot of the credit for the car’s handling to its new multilink front suspension that, as Mercedes chassis engineer Reiner Scheu illustrated on the back of a press release at our request, claims to maintain a more consistent tire patch and camber control throughout full suspension travel compared with a strut or unequal-length control-arm setup. In regard to turn-in crispness, it was ultimately the vehicle’s multilink rear suspension that let us down by squishing and squirming under pressure. That said, the C250’s air-sprung ride quality on the highway was composed and serene. 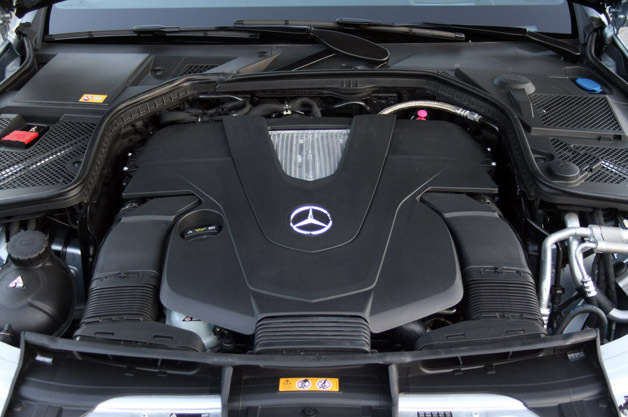 Mercedes claims a 0-to-60 time of 6.6 seconds for the C250, and although we can’t verify that number, we can tell you the engine pulls eagerly and shifts snick off transparently under light throttle. The gearchanges get a little more obvious under a heavy foot. Brakes are textbook Mercedes: firm, with crisp braking action at the top of the pedal travel. The C400 felt largely the same, but its responses to inputs weren’t quite as sharp, as if someone had slipped a soaked loofah between the body and suspension contact points. Acceleration is of course improved, the V-6’s slightly rowdy exhaust burble replacing the four-cylinder’s polite woofle. Braking felt less refined in the C400, softer in bite and harder to modulate; later, an engineer confided that there are always “concerns” regarding pad formulas for the American market, where brake noise and wheel dust are big complaint generators, so take that as you will. Still, Mercedes maintains that final tuning of the C400 has been done and the cars that go on sale here in September will be unchanged from our test car. So, does the new C-class succeed in toppling its 3-series nemesis from its perch atop the small-sedan hierarchy? Unfortunately, it’s not that simple. While Mercedes was hard at work creating the 2015 C-class, the world changed. The 3-series mutated and spread across the segment in an effort to appeal to a broader spectrum of buyers, and new competitors such as the excellent-to-drive Cadillac ATS and Lexus IS350 F Sport joined the fray. But for a maker with a proven track record of knowing its audience and unafraid to walk its own well-established path to please them, this C-class should be right on target.